Have you reached the next level and still don’t have a record deal with international retail distribution? Do you have fans who ask for your album at Amazon or Barnes & Noble or other stores and the store manager can’t get it for them? Have you been ripped off by other digital download services and your tracks aren’t showing up in all the digital places your fans use to buy music? More importantly – are you getting PAID for the music that has been sold? It makes sense to round out your project with the ability of your fans to find you in their favorite outlet. Our retail distributor, MVD Entertainment, is an international music and DVD distributor. MVD executes the physical fulfillment of its products servicing major chains, distributors, one-stops, online retail, and independent retail. Payments are made monthly for hot sellers and quarterly for those that aren’t. Our relationship with the artist is on consignment. Orders from MVD vary between 100 – 1000 initial units, depending on the Artist and their prior projects and genre. Our digital distributor, The Orchard, distributes digital music and video to hundreds of online and mobile retailers around the world using the most efficient delivery and content management systems in the business. Their marketing efforts offer speed and thoroughness at getting your music on ITunes, Amazon and hundreds of other sites. We tailor every program to meet the budget and needs of the Artist and their Team – we charge NOTHING for this – we don’t make any money until you sell, and our cut is very small. We work direct with your Team hired by you (the Artist) and we can also help you (the Artist) to locate your Team. We do not want to own your master – your master belongs to you! 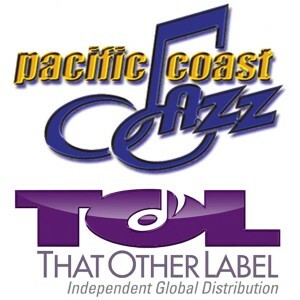 Pacific Coast Jazz / That Other Label are seeking new artists for international distribution. We specialize in quarterbacking your project from start to finish – you call the shots, we help you to do it right way while saving you money. With hundreds of new records being produced each month, it’s a tremendous challenge to get the proper exposure for your music. We can provide the personal insight and guidance you need to plan and execute the right strategies and opportunities for your new CD and your future in the music business. First, you need great production and sound people. You hire the best, the most experienced musicians to accompany you on your recording journey. Second, you really need to talk to us as EARLY in the process as possible (BEFORE you manufacture) so that we can help you think about how and where to put together your publicity and promotion team and help you get your artwork on your DIGIPAK perfect. We know what radio likes, we know how best to make it visible in a retail store full of thousands of other CD’s. (Yes, there ARE still people who buy in stores!). We will supply you with your UPC code, your ISRC Codes (you MUST use ISRC codes in your master!) and we’ll give you a part number that will help all the buyers identify you in their system. Third, you need to press your CD in the most beautiful manner possible – we highly suggest the “digipak” format and skip those nasty old jewel cases – they only break in shipping and actually cost more in postage than they’re worth. (We had a 10% breakage factor on one of ours!) To make a digipak truly beautiful, you must have a good designer. And of course for a lot of the pieces of this puzzle — you’ll need great photography. You need a dependable, high quality manufacturer and we are happy to recommend specific manufacturers for your project; just ask us. Fourth, you need to get your CD into the distribution chain and social networking. That’s the only way people will know it’s available to buy. We know how to build the plan for the execution of your project so that you’re not spending a bunch of wasted money. We can build a plan that fits within your budget and we have access to MVD’s social networking solutions as well as a lot of our own experiences. We manage your distribution and we focus primarily on the budget-conscious musician. If you have distribution and you use Social Media to get the word out, you’re half way there. We also work with specific people who do get the word out to the retailers (the hardest group of folks to reach) who buy music for their stores. We use Almighty Music via New Releases Now and would help with this should you sign up to have us do all your retail and digital distribution. In order for us to know how to proceed with your new project, please give us some information. Send us an email describing your music in full. Describe your budget, what you’re looking for and provide links to the music and especially to your website. If you want to remain independent, talk to us before you “sign” to a label – don’t do it until you know exactly what you are or are not getting into. Ask a few questions, don’t look at a “signing fee” until you know when and how much the next one will be – exactly – and for how long. Just want distribution? We’re happy to talk to you about helping you with all your distribution needs and you can do all the promotion stuff on your own. Then you’d have the international distribution that will help in all your other publicity and promotion efforts. We can make it simple and give you the biggest opportunities possible. Be sure to talk to us before you press your CD as there are certain things we need to do first that are part of your artwork that you send to manufacturing. And before you have your master made, don’t forget to have your engineer include your ISRC codes! And ALSO – be sure your mastering guy puts the .bin cd text information into your master! If not, the text won’t show up on the readout in modern CD players! It is SO important. A reiteration about our distribution services: Pacific Coast Jazz / That Other Label Distribution Services Our retail distributor, MVD Entertainment, is an international music and DVD distributor. MVD executes the physical fulfillment of its products servicing major chains, distributors, one-stops, online retail, and independent retail. We’ve been working with MVD for four years (prior to MVD, we were distributed by Big Daddy Music, who merged with MVD in 2008) and we are pleased with how they pay monthly and our relationship is on consignment. Orders from MVD vary between 100 – 1000 initial units, depending on the Artist and their prior projects and genre. We take all genres, not just jazz. The percentage of net sales to Artists is 40%; details available direct from PCJ/TOL. There is a 3 month lead time for all submissions. Our digital distributor, The Orchard, distributes digital music and video to hundreds of online and mobile retailers around the world using the most efficient delivery and content management systems in the business. Again, we’ve been very pleased with their marketing efforts and speed at getting our music on iTunes, Amazon and all the other sites. The percentage of net sales to Artists is 75%; again, details are available direct from PCJ/TOL. There is a 6 week lead time to get music up through The Orchard. We charge NOTHING to be affiliated with us. We make NO money – unless YOUR MUSIC SELLS. We DO NOT TAKE OWNERSHIP OF THE MASTER – the master belongs to the Artist. What is timing for retail submissions? FOR BOOKING AGENTS AND TALENT BUYERS If you’re here because you’re not a musician, but you’re looking for a great band for your event: Pacific Coast Jazz/That Other Label represents several artists that may fit the needs for your special event or fundraiser. These include (but are not limited to) corporate luncheons, dinners, wine tasting events, (silent) auctions, benefits, festivals, and awards ceremonies. They all do weddings and small private parties, openings for new stores and coffee houses, and any other event you can think of. In this specific economic demographic, we appreciate all of the work that you put into making your organization a success. Whether through fundraising events, or business and philanthropic ventures, you are reaching the public in a unique way that we want to help support! Some of our artists donate their time to philanthropic events. FOR LABELS Pacific Coast Jazz is now proud to offer help to other inde labels looking for a distribution channel for their artists. We have a wonderful relationship with an international distributor reaching retail accounts here in the United States as well as the countries of Canada, UK, Germany, France, Italy, Benelux, Scandinavia and including Japan, Australia and Brazil. PCJ will offer inde labels the opportunity to “pass thru” our distribution channel at similar rates as our own artists without our servicing options. At Pacific Coast Jazz/That Other Label, we provide quality live jazz entertainment within your budget, which can only add to the success of your special event. Reach your prospective and loyal employees, clients, patrons, and donors through music! Let us help set the ambiance while you interact with your colleagues. Leave a lasting impression of your business while supporting live jazz in your community! For more information, please contact Donna Nichols at pacificcoastjazz@gmail.com – in the subject line please put NEED MUSIC FOR EVENT. Her experience in this area will be very helpful to you if you’ve done this before or if you’re new to it.